Dr Marc Lewis is a neuroscientist and professor of developmental psychology, now teaching at Radboud University in the Netherlands after more than twenty years on faculty at the University of Toronto. He has authored or co-authored more than fifty journal articles in neuroscience and developmental psychology. Presently, he speaks and blogs on topics in addiction science, and his critically acclaimed book, Memoirs of an Addicted Brain: a neuroscientist examines his former life on drugs, is the first to blend memoir and science in addiction studies. 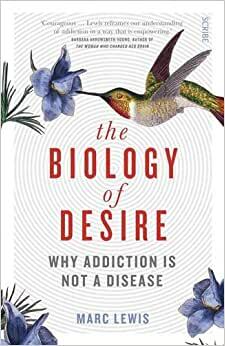 This is one of the best books I've read in a long time regarding addiction, though psychology and neuroscience more in general. It should be clear from the outset Dr. Lewis is not anti-psychiatry/medicine/science/etc., does not argue along the lines of Thomas Szasz regarding disease as a metaphor, or in anyway is blind to modern developments in neuroscience, brain scans, or anything along those lines. In fact, he's a neuroscientist and former addict (talk about turning it around). This books underlying thesis is while addiction is a harmful, compulsive, and incredibly hard to control, it is not a disease and should not fall under the disease model. He does not argue in anyway the brain doesn't change from ongoing drug use, as you'll no doubt see in trainings/lectures where people show a heroin brain next to a normal one. Rather, what he argues is the brain changes from just about any experience. So, if you are craving chocolate and have a similar scan your brain will show differences than a brain not craving chocolate. Similarly, if you're in love, which can make us all be a little nuts, your brain will show a very similar scan to someone addicted to heroin. His overall point is strong desires, achieving those desires, strong desires, achieving those desires, eventually results in a feedback loop that disrupts neural/brain processes responsible for modifying our behavior. What was most interesting to me was his discussion of ego depletion in Chapter 8, where he discusses treatment methods or advice from people is actually self defeating. If you are attempting to stop using heroin, alcohol, or what not, simply saying to yourself "I won't use", "I must not use", or something similar is one of the worst things to do because it depletes the very area of your brain that helps you not use heroin, making it more likely you will. Rather, you should reinterpret your experiences, view of the substance, and the situation, which results in less or no depletion. The reason I like this book so much is it's not a pie in the sky, nonsense fluff you will often read and is based on solid research and the way our minds work. He easily combines various brain structures with real life examples to make his underlying point. It is both intellectually demanding (remembering the various brain regions and their interactions) but also very dramatic and real. It's hard not to feel sympathy for some of the people he presents. I'd highly recommend this book. Again, it's not dismissing neuroscience or brain research, he points out multiple times it's important to erase the stigma of addiction so people can get help, but he shows in a very concise, understanding way we should not view addiction as a disease similar to cancer, diabetes, or what not. It's very readable and combines current research with good stories of people he's spoken to who have been through heroin, meth, and alcohol addiction up to someone being anoxeric and how they're similar. One of the greatest books I've read in recent history. If addiction is a disease, so is love. Fully explains the changes in your brain as addiction progresses, and what it takes to create new channels, and realign your life. Also goes over the problems of the current "I'm helpless over my addiction" model, and why it only works for the people who dive completely into the rabbit hole. Many addicts are still functional, and this just doesn't work for them. We need individualized, personal treatments. Not institutions. I found this a fascinating book. The author outlines his theory of how the brain works in addiction of any sort, including the traditional addictions of alcoholism and drugs as well as more recently described entities such as internet gaming and gambling. His main point is that addiction is not a disease but arises form normal brain mechanisms that have developed during evolution. The importance of this is that addiction is not a disease and does not need to be treated or cured. Instead the author proposes that addiction can be resolved by using the mind to think your way out of it. He does not suggest that this is easy but I think this idea would be very encouraging to anyone struggling with addiction. I am not an expert in the field of neuroscience, and I intend to do more reading, but to me this is a plausible model for addiction.